This has always been one of my favorite Angelheart dresses. 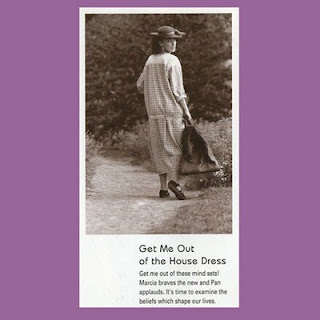 The Get Me Out of the House Dress first appeared in the Spring/Summer 1992 Angelheart Designs "Return of the Goddess" catalog. It was available in a Light Plaid and Dark Plaid linen. Jeanne brought the style back again in 2001 in the first Vintage Angelheart collection as a Flax group. It was available in Oatmeal Stripe and Check, Nautical Stripe and Check, Natural Handkerchief and most commonly in Indigo Handkerchief.